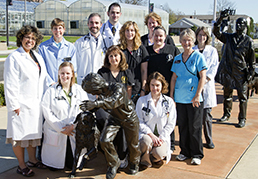 The Purdue Comparative Oncology Program (PCOP) in the Purdue University College of Veterinary Medicine was formed in 1979 with the goal of improving the outlook for pet animals and humans with cancer. Clinician scientists identify forms of naturally-occurring cancer in pet dogs that are similar to those same forms of cancer in humans. Subsequent studies are designed to be a "win-win-win" situation in that the individual dog with cancer benefits, the outlook for other dogs with that cancer may improve, and the successful results in dogs may lead to advances in humans with cancer. 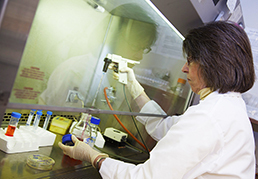 The PCOP is also committed to providing compassionate care for pet animals with cancer, and for training the comparative oncology team of the future including veterinarians, veterinary technicians, veterinary oncology specialists, and other scientists. The Purdue University College of Veterinary Medicine has a program aimed at helping dogs with urinary bladder cancer, especially dogs with the most common type of bladder cancer called transitional cell carcinoma, or TCC. 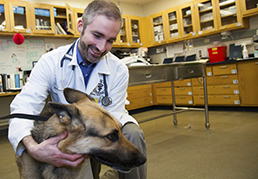 The Purdue Comparative Oncology Program, also called PCOP, was formed with the mission to identify types of naturally-occuring cancer in pet animals that closely mimic those same types of cancer in people, and then to conduct studies that will improve the outlook for pet animals and humans with those cancers. 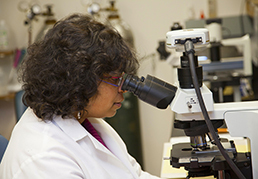 In addition to the work in the clinics diagnosing and treating cancer in pet dogs and cats, the Purdue Comparative Oncology team diligently works in a laboratory setting to discover new ways to prevent and treat cancer. There are several different medical conditions in dogs that can cause blood in the urine, straining to urinate, and masses in the bladder. These include infection and inflammatory processes, and multiple types of tumors.